When John and I lived in Michigan, one of our favorite places for a quick lunch was Grand Traverse Pie Company. It is basically a Panera, but better because they have the best pies ever! One of the pies that we loved was a mountain berry pie with blueberries and raspberries. I was really craving some mountain berry last week so I thought I would try to recreate it. I wanted to make my pies individually sized, and I saw a great cookie cutter pie crust idea that I thought I would try. All you need is a large flower cookie cutter (I didn't have a flower, but I did have a snow-flake that looked flower-ish... so I figured it was close enough!). 1. 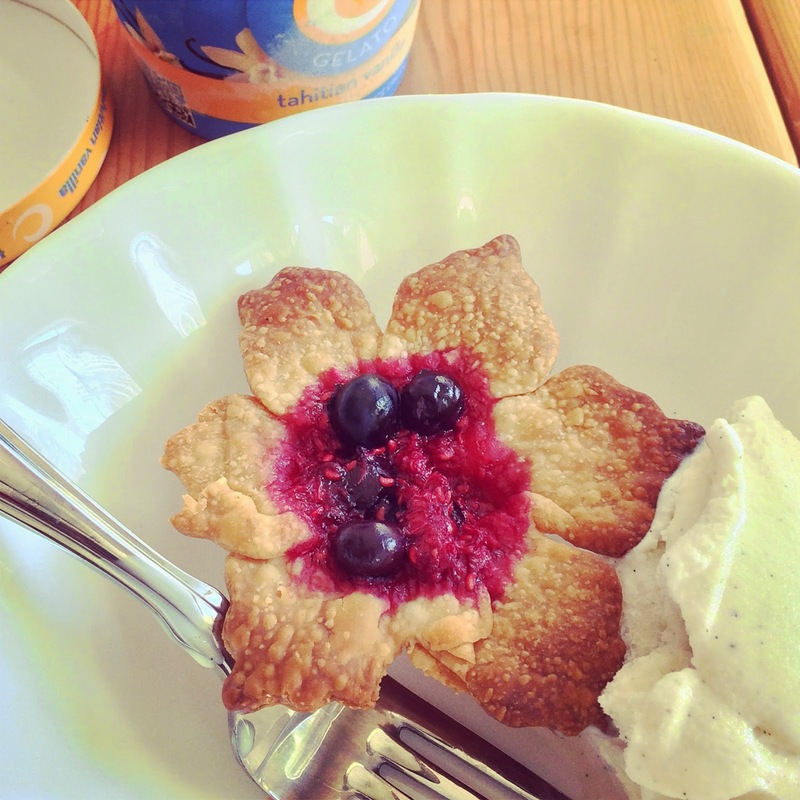 Roll out the pie crust and use a flower cookie cutter to cut out the shapes. 2. 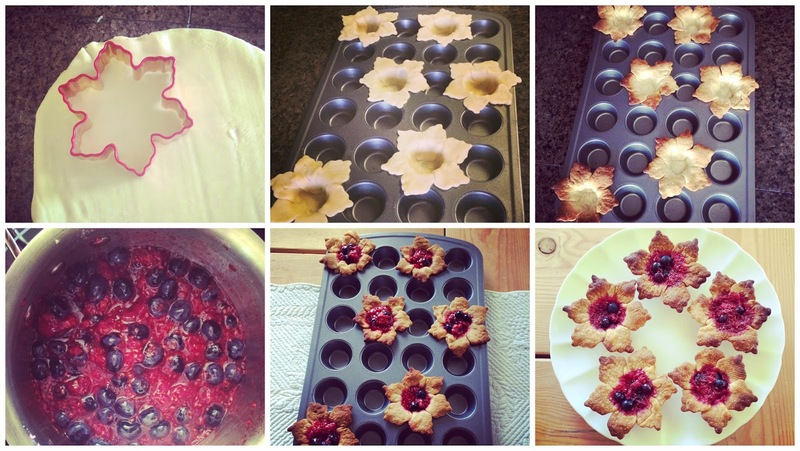 Press the center of the flower into the bottom of a mini muffin pan. 3. Bake according to the pie crust recipe. 4. To make the pie filling, combine a 1/2 pint of blueberries and a 1/2 pint of raspberries in a sauce pan with 1 tablespoon of fresh lemon juice and a 1/2 cup of sugar. Stir until the sugar is dissolved and the berries are soft. 5. Put a scoop or two of the berry mixture in each pie crust. 6. Bake for an additional 5 minutes or until the crust starts to brown. Be careful - my crusts got toasty fast! 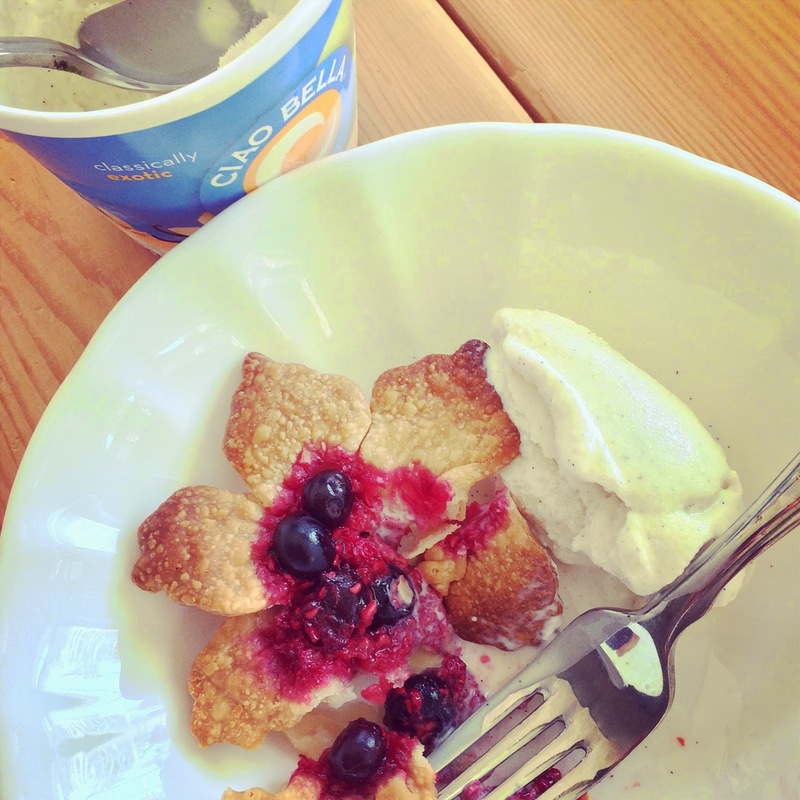 Linking up with Tuesday's Table and Delicious Dish Tuesday. 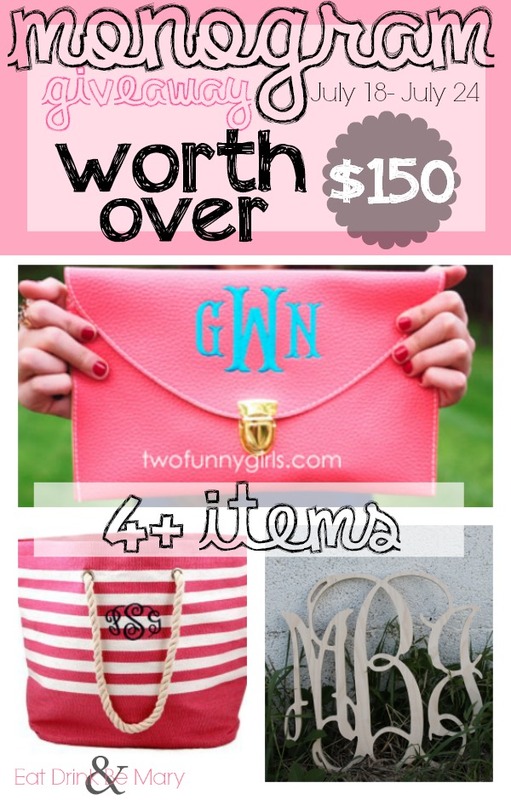 Don't forget to enter the monogrammed giveaway! Oh how I love the Grand Traverse Pie Company - getting a pie from there is always a lovely lovely treat! I love how you made your pies all individual sized, they look so juicy! Those little pies are both pretty and yummy looking!! Love it! These are so pretty and I bet they are delicious! I love fruity pies! Those look SO CUTE and so delicious! That looks amazing. You're Martha Stewart. These look so good!! There is nothing quite like a homemade pie!! I love that these look like flowers!! So cute! They sound delicious! Those look delicious AND cute!!! How cute! I would have never thought to have done that with the crust, love it! These are adorable! I just pinned them! I will be making these some day soon! My goodness... my husband would pass out if I put something like that in front of him. Yummm! Can you believe I've never been to Grand Traverse Pie Company?! I have no idea why but I need to change that!! These are so pretty! Awh! I want to serve these someday soon! That is the cutest pie! Snow flake, flower, close enough! These are SO cute! I love that they're mini and 'flower' shaped too. I've heard of that pie place, but I've never been. "Make a pie" is on my summer bucket list so I may just be making these little ones. So cute! so cute! how to you just throw things together like this??? Thank you for linking up with us at Delicious Dish Tuesday! THESE ARE GENIUS. And I think I have just enough blueberries and pie crusts left to do them... YES. You are a genius.